Times of the Islands – Up, Up and Away! Embry Rucker was the Islands’ first resident pilot. Today, a regular daily air service links the islands of the Turks & Caicos, while international connections bring travellers to and from the United States, Canada, United Kingdom, Dominican Republic, Jamaica and Haiti (among other countries). But 50 years ago there were no airports, no flight infrastructure and bush was cleared away to create basic air strips. 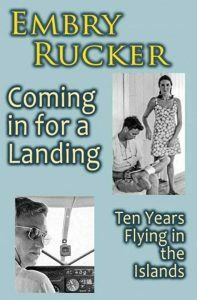 Embry Rucker was the first resident pilot in the Islands and he has documented the experience in his memoir, Coming in for a Landing—Ten Years Flying in the Islands. This is Embry Rucker’s memoir about his early days of flying in the Turks & Caicos Islands. Embry Rucker was born in Philadelphia, Pennsylvania in 1941 and he grew up in Louisville, Kentucky. After serving a three year term in the US Army, he attended flight school in Manassas, Virginia in 1965 and obtained his commercial pilot’s license, instrument rating and multi-engine rating. Rogers Morton (who later became a congressman and Secretary for the Interior in the US government) and Kip Dupont were two members of the “Seven Dwarfs” of Provident Limited—the company which started the commercial development of Providenciales. The other members were Teddy Roosevelt (grandson of the former US President), Peter Thompson, Tommy Coleman, Fritz Ludington and his mother. At the time there were only 400 residents in Providenciales. Provident purchased 4,000 acres from the British government, and in return they had to build an airport and dock and cut new roads on the island. 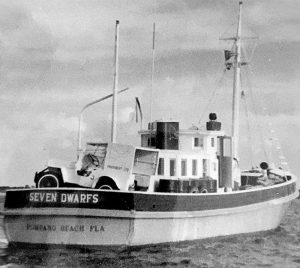 The Seven Dwarfs was a freight boat used by Provident Ltd. to carry materials from the US. In the days when no work permits were required, Embry became a foreman in the construction of the Third Turtle Inn on Providenciales, which commenced in 1967. Finally, after boating, bookkeeping and building, his flying career took off when Lewis “Lew” Whinnery arrived in the Islands. “Lew had been down in Guyana mining diamonds. He thought he’d start a flight service in Grand Turk and South Caicos. Fritz Ludington sai, ‘You can use my wife’s plane, and this boy has his pilot’s licence.’ That was me!” At that stage Embry had about 300 hours flying time. South Caicos was then the commercial hub of the Caicos Islands and Embry moved to live there, renting a room from Captain and Mrs. Stanley Malcolm. Captain Malcolm ran the Sea Horse, the government launch between South Caicos and Grand Turk. Sea Horse was known locally as the “Vomit Comet,” taking four hours to travel between the islands, sometimes in very rough seas. By contrast, the new air service between South Caicos and Grand Turk took only 14 minutes. However, to get airborne there was a lot of groundwork to be done. “There were no roads in North and Middle Caicos,” Embry recalls. “We kept building little airstrips, literally chopping down tall bushes, and starting to fly in there. We had three air strips in Middle, about two minutes apart. You’d be up and down in no time. One bigger settlement we couldn’t get into was Bottle Creek in North Caicos. We were Her Majesty’s official mailman, so we threw the mailbag out the window and hoped we’d hit the post office! We never did figure out how to pick the mail up from Bottle Creek,” he laughs. A short 800 foot airstrip created in Providenciales was called the “Machete Airport,” as that’s what locals used to clear the field. 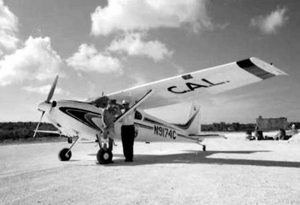 This Cessna 180 was the first plane Embry used to fly for Caicos Airways. Without aviation infrastructure, flying conditions could be challenging. When Embry needed to land at night for a medical emergency, a truck or car was pulled onto the runway, shining its lights to guide him. “We had some close shaves. 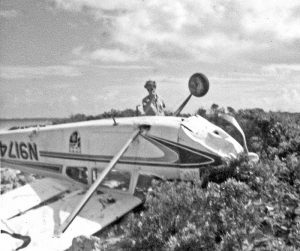 Once, the landing gear collapsed on a take-off in Conch Bar, Middle Caicos. The airplane went straight down, nose first, and we ended up hanging from our seats. We had to walk 10–12 miles to the other end of the island to get a ride home.” Embry recalls, “We tried to avoid landing in downtown Grand Turk at night because there were always donkeys and cows wandering around. The strip was only 1,500 feet long, and you had to be spot-on every time.” The airstrip was, in fact, a local road—Church Folly. Once Embry had cleared the 20 foot high power lines and the prison, he would have to drop quickly to avoid crashing into the cemetery wall. This image shows Embry following a crash near Conch Bar, Middle Caicos. No one was injured. Embry was awarded the Turks & Caicos Islands Medal, given to people who were Turks & Caicos government employees. His medal, which he considers a great honour, was for service with distinction in the field of aviation over a 10 year period from 1967 to 1976. He held a Permanent Resident Card—the fourth ever issued—and he was later given Belongership for his significant social and economic contribution to the country. Embry was conscious of not losing the oral history of the early days of aviation and development. “I thought to myself—all these old friends of mine in the Islands are getting pretty ancient, and their stories are going to be lost. In 2005 I got a recorder and I went around the Islands to record stories from the likes of Speed Gardiner in North Caicos, Oswald Francis in Grand Turk and Cardinal Arthur from Middle Caicos. We had some great conversations. Elsa James in Grand Turk did a great job transcribing the interviews.” The recordings and transcripts were donated to the Museum for its archive. Even though his own book was published recently, he actually started it in 1986. “I’d dictate some stuff into a tape recorder for my children and grandchildren. Every ten years I’d add a little more. Finally, two years ago, I looked at all the grey hair in the mirror and I thought if I’m ever going to do anything with this I better get on with it.” Harry Rothgerber acted as an editor and writer, and Embry says the more he talked about it, the more came back. Embry’s brother Rudy, a writer and publisher, helped to put it together. Although it’s been over 50 years since Embry first flew in the Islands, he played a crucial role in creating the modern aviation industry in the country, and his influence continues today. The book Coming in for a Landing – Ten Years Flying in the Islands by Embry Rucker is published by Transreal Books and available on Amazon and Kindle.